Steve Holman received his third straight Gabby Award earlier this week, an award given by the Georgia Association of Broadcasters to recognize the best sports play-by-play broadcaster.Holman was also inducted into the GAB Hall of Fame earlier this year for his 32 seasons on the radio covering NBA Basketball and the 1996 Olympics. Being honored by his peers gives Holman a sense of pride. Now at the age of 63, Holman is considered one of Atlanta’s most accomplished broadcasting figures. Holman’s vision of success in the world of Sports Journalism began as a 8 year old in Massachusetts. He never envisioned to reach the accolades bestowed upon him during his illustrious career. Holman wanted to be like his idol, Johnny Most. 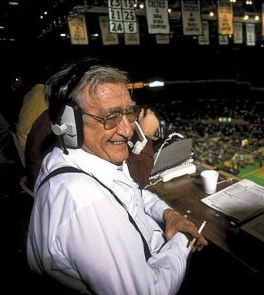 Most was the raspy voice of Boston Celtics basketball from 1953-1990. Holman knew after listening to Most call some of the great Boston Celtics teams during the 1970’s and wanted to embark on the same experience, not as a member of the Celtics, but as the voice calling some of the great moments for a NBA Franchise in the future. Holman’s destiny was to embark in the world of Sports Broadcasting. Holman’s dream paid off due to the hard work and determination instilled as a child, he would find idols to study and eventually developed his own craft which earned him a chance to work with the local commentators. 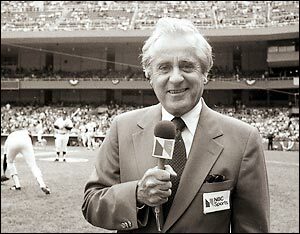 At the age of 17, Holman earned the opportunity to work for another individual who was a role model on his journey, Curt Gowdy. Gowdy was well known as the longtime “voice” of the Boston Red Sox and for his coverage of many nationally televised sporting events, primarily for NBC Sports in the 1960’s and 1970’s. Holman credits Gowdy’s guidance early in his career as a launching pad. A few years later, Holman earned the opportunity to work on the network which his hero, Johnny Most, covered Celtics games, in a entry level position for WCCM. Years after having the vision of working for the NBA, here he was working with the man whom inspired his journey from the age of 8 years old. Most and Holman bonded over the next few months, earning him the opportunity to keep the score during Celtics games; however, that would change one night in November 1976. Most was calling the Celtics game until the Third Quarter when he lost his voice during a live broadcast, giving Holman a chance to finish the broadcast for the current game. Imagine this…. The biggest opportunity of his life was given to him by the man he wanted to emulate as a child. Holman took the opportunity and never looked back. 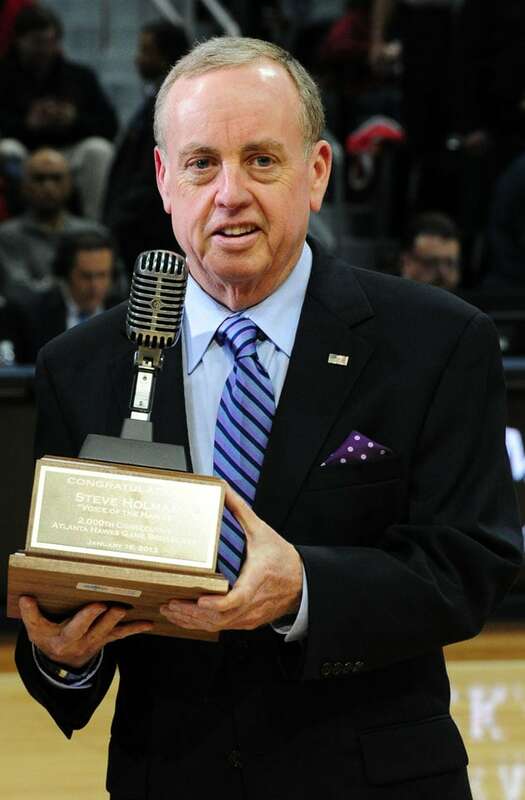 As he enters his 33rd season as the “voice of the Atlanta Hawks”, Holman has covered 2,417 consecutive Hawks games. He shared the duties with John Sterling before he joined the New York Yankees broadcast team in 1989, taking his actual streak to much higher numbers. Holman takes pride in his profession. His father was a craftsman. Holman watched his father work at a job on a daily basis which wasn’t appealing to him. Holman was instilled with the mentality, even at a young age, to give 100% on a daily basis, especially when it’s for a job that he enjoys more than anything, covering the Atlanta Hawks. Every game brings more excitement for Holman and every broadcast presented another adventure. 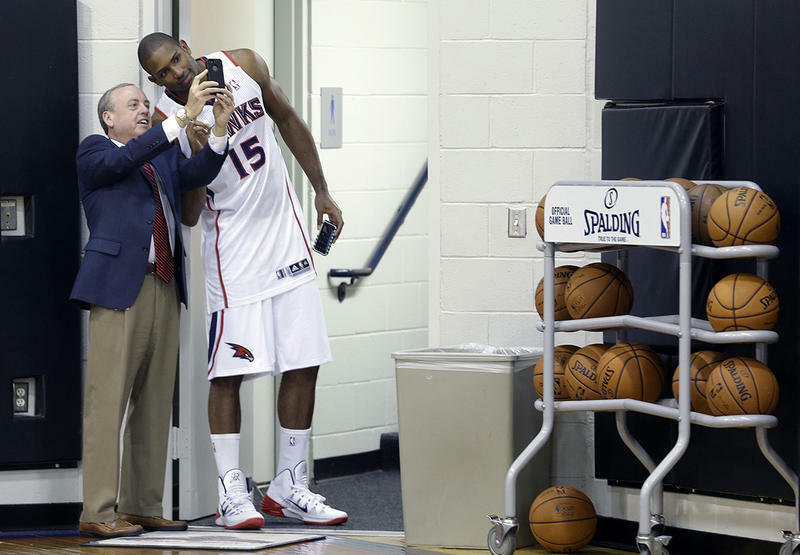 Atlanta Hawks center Al Horford, right, checks out a photo on Hawks broadcaster Steve Holman’s phone. The Atlanta Hawks are a major part of Holman’s successful career in the world of sports and he considered the organization as a member of his extended family. No one wants to leave their family. The players, coaches, the fans, the season ticket holders, Holman feels the connection with through the years of the Hawks struggling to win games, the resurgence of the franchise, the peak of the franchise in the Dominque Wilkins’ years, and the relationships built with people that filled the stands of the Omni and now, Phillips Arena, on a nightly basis. As the 2017-18 NBA season is less than two months away, True Believers know where to find Holman during the nights of October to April, he’ll be with his Hawks family, remaining “True to Atlanta”.